Hamish Vernal will now lead the Aberdeenshire SNP after the group was forced into opposition. 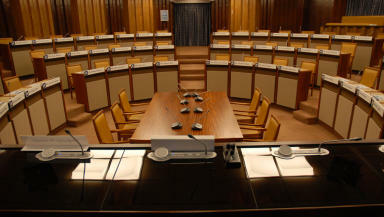 The Aberdeenshire SNP has changed leader weeks after being forced into opposition on the local council. Although the largest party by far in the area following the May elections the SNP group was unable to form an administration and is now working in opposition to the Conservative led Aberdeenshire Alliance which also include the Liberal Democrats and some independent councillors. The group made the change, along with agreeing other key shadow positions in the group, at its first meeting since the council’s summer recess. After five years at the helm Huntly, Strathbogie and Howe of Alford councillor Joanna Strathdee has been replaced by Inverurie and District councillor Hamish Vernal. Mr Vernal said: “The SNP Group has spent some time taking stock of where we are and how we can best move Aberdeenshire forward in the interests of its residents. “Clearly, at a time when frontline services are being cut, when classroom assistants are being removed and when sheltered housing warden cover is being reduced, it is simply unacceptable to suddenly find that the council has underspent to the tune of £20 million. “That is money which has been taken from the taxpayer on the understanding that it would be used to finance exactly the sort of services which we have seen being cut. This is just one example of where fresh thinking and a more thorough scrutiny of the council’s budget is required, but I fear we will not get that from the Tory-led coalition. At May’s elections, the SNP emerged as the largest party in Aberdeenshire in terms of both votes and seats, with twice the number of councillors as the next largest party. Other party’s said they could not reach an agreement with the group however with Lib Dem leader Martin Kitts-Hayes calling the SNP “too fragile”. Mrs Strathdee said: “I’m immensely proud of having led the SNP Group to a position where we are now the biggest party in Aberdeenshire, both in terms of seats and votes. “Obviously I remain disappointed that the SNP was prevented from forming the new administration but that’s politics and we remain in a strong position as the largest group by far on the council. Aberdeenshire East MSP Alex Salmond added: “Joanna has led the council group in Aberdeenshire with great distinction over these past five years and the Party is extremely grateful to her for her hard work and dedication.